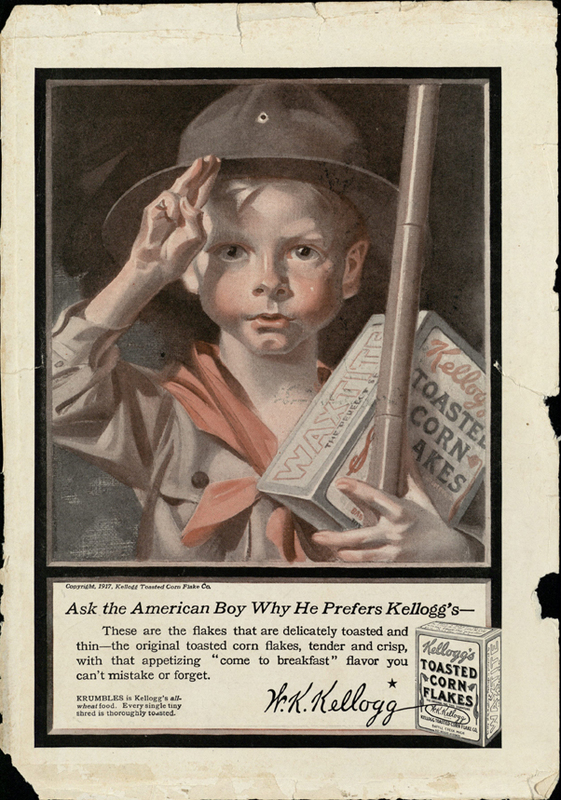 A patriotic advertisement for Kellogg’s Toasted Corn Flakes during WWI. The Thomas L. and Pit Dodson Collection has hundreds of similar early- to mid-twentieth-century art prints and clippings, providing a colorful window into American culture. 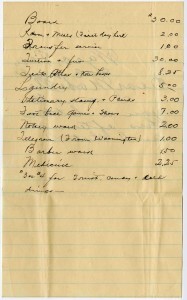 Kenneth Hazen Aynesworth papers, 1826-1965, undated: Aynesworth’s papers consist of family materials, correspondence, literary productions, collected materials, and medical records collected by Kenneth Hazen Aynesworth, a local doctor who gave the first donation to establish The Texas Collection in 1923. [Waco] Branch Davidians: “The Facts About Mt. Carmel” Exhibit collection, 1961-2004, undated: This records group contains materials collected by various groups and individuals (including Calvin Smith of the Strecker Museum) to organize an exhibit about the history of the Waco Branch Davidians. The exhibit, entitled “The Facts About Mt. Carmel,” was featured at the Helen Marie Taylor Museum in Waco, Texas, in February 1994. 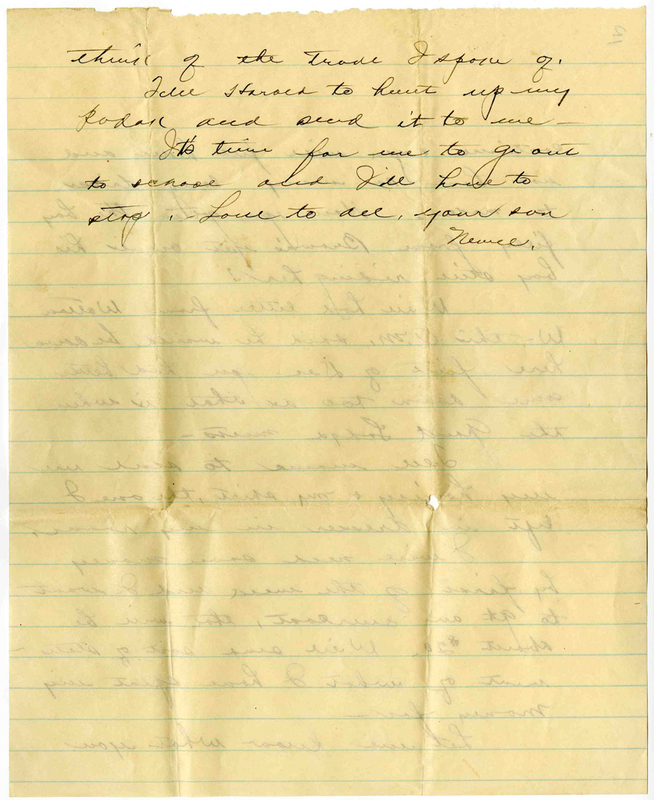 Adina E. De Zavala papers, 1830 (copy) -1940, undated: These papers document De Zavala’s historic preservation efforts in Texas to protect significant architecture in the state. 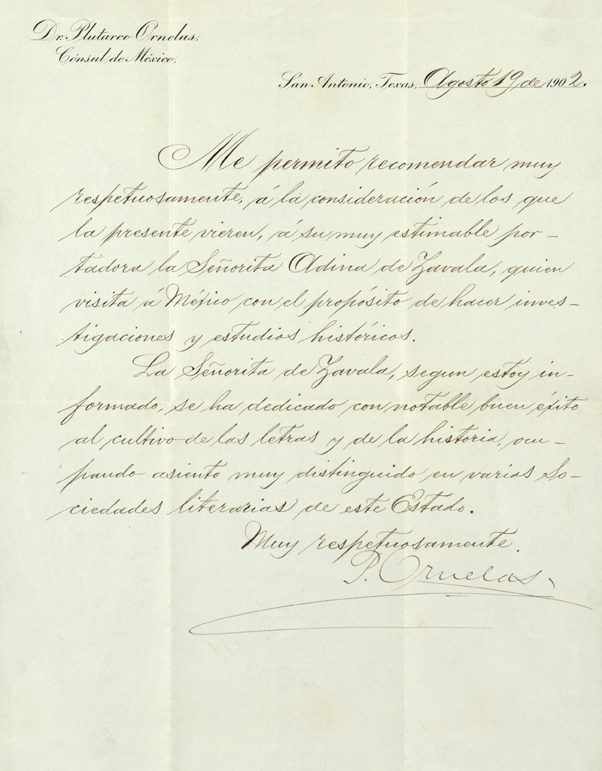 A letter of recommendation written by the Mexican Consul in San Antonio, Dr. Plutarco Ornelas, for Adina De Zavala on her historical research trip to Mexico in 1902. Thomas L. and Pit Dodson collection, 1710-1991, undated: The Thomas L. and Pit Dodson collection contains a wide variety of collected materials, including literary productions, books, photographic materials, and scrapbooks. While spanning three centuries, this collection consists primarily of early- to mid-twentieth-century art prints and periodical clippings. Marvin C. Griffin papers, 1940-2010, undated: The Griffin papers contain literary productions, photographic materials, audio recordings, and other materials pertaining to Reverend Marvin Griffin, an African American pastor who fought for the spiritual and political freedoms of his congregations at New Hope Baptist Church (Waco) and Ebenezer Baptist Church (Austin). 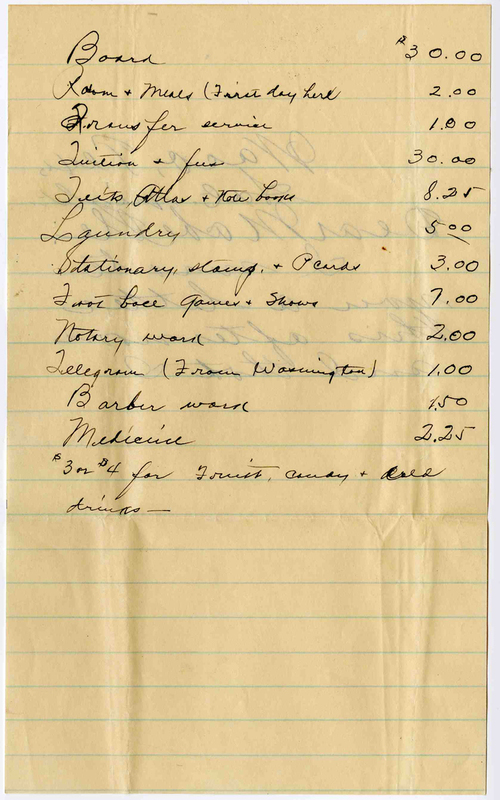 Roxie Henderson collection, 1852-1919: This collection contains personal items and collected materials of Roxie Henderson, a Baylor graduate who served during World War I as an American Red Cross nurse. Learn more. Isabella M. Henry papers, 1931-1981, undated: Henry’s papers features manuscripts detailing her career in the Women’s Army Corps and the Women’s Army Auxiliary Corps during World War II. Learn more. Lula Pace collection, 1895-1969, undated: This collection contains student notebooks, topographical maps, and scholarly publications by Lula Pace, a PhD graduate of the University of Chicago who served as a science professor at Baylor University in the early 1900s. Learn more. Baylor’s 1909 Homecoming celebration was one of the very first collegiate homecomings held in America. It took place on Thanksgiving weekend and included a band concert, class and society reunions, and an old-time “soirée” where students could listen to music. The idea of a homecoming would certainly have been familiar to many members of the Baylor community as it was a common celebration in rural southern churches. Homecoming in these churches usually took place annually as a way of bringing people who had been scattered by migration into cities and towns back to their sacred place of origin. Sometimes the festivities would honor the charter members of the congregation, and always there was the celebration of families and the recognition of the church as the “family of God.” In this way the themes of history and tradition, community and family were woven into the fabric of the day. The letter sent in its Home-coming envelope, is addressed to Papa. Apparently students’ needs in 1909 were not so different from those today. 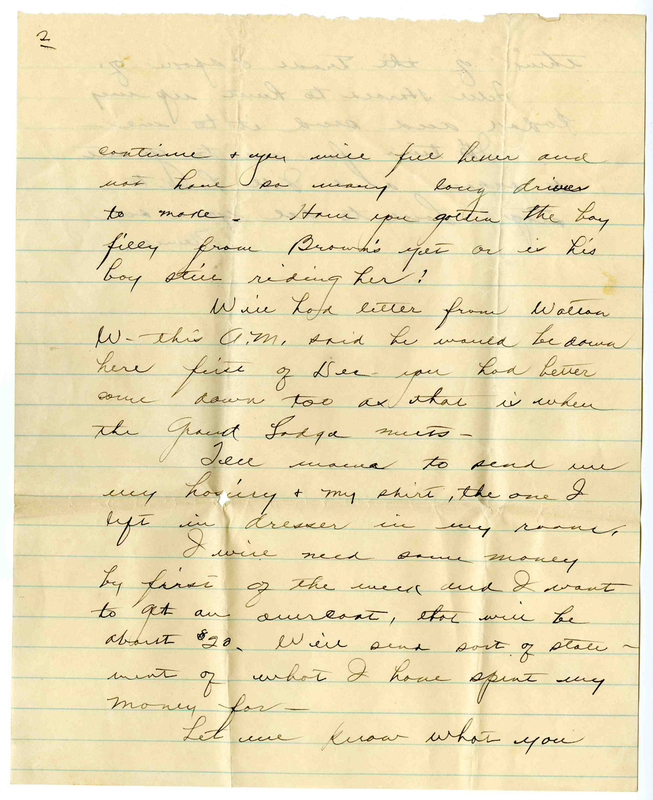 The author asks for his mother to send him some clothes he left behind, and he also needs some money by first of the week to buy an overcoat. Just to let everyone know that he’s being frugal, the student sends home a statement of how his money has been spent. 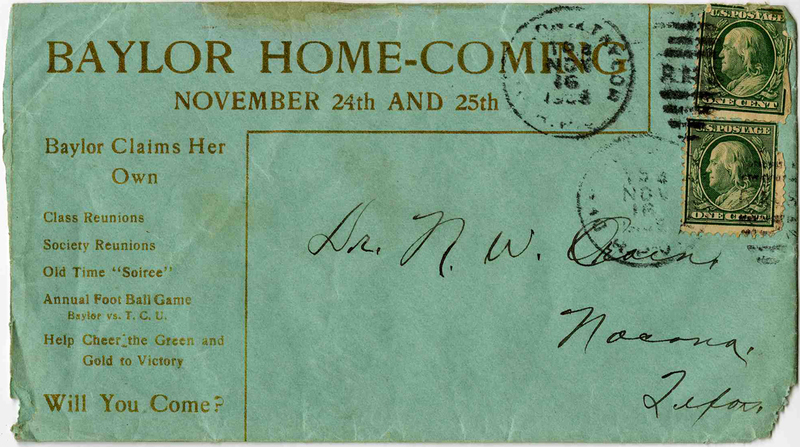 You can see more items from the history of Baylor Homecomings on exhibit at The Texas Collection in Carroll Library. We hope you’ll stop by to join the fun! 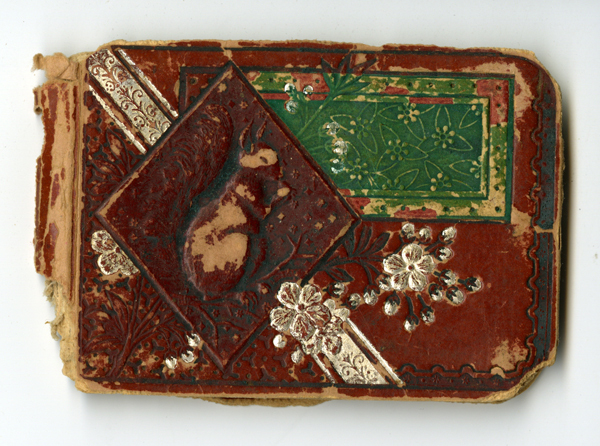 Tucked away in an envelope, in a box, on a shelf in the basement of Carroll Library is a tiny book embossed with a picture of a rabbit. Smaller than a smart phone, this wonderful little object is an autograph book that once belonged to Ida Ainsworth of Liberty Hill, Texas. It’s dated 1888 (though a few pages seem to be from 1887), and is signed by her friends and family, and by her teacher. Though autograph books may still be found, with a few exceptions, the messages in Ida’s book are strikingly different from those a modern student would write. They are often touching and sober, recalling the passage of time, the parting of friends, and the inevitability of death. They reminded me a bit of memento mori, and I thought of all of Ida’s friends who have long since passed. Yet, even as it brings to mind the dead, this little book also stands against time’s stream, as each page becomes not only a memento mori but also a memento mei—“Remember me!” Dear Ida, Dear Reader, remember my youth, my laughter, our friendship. Remember me as I was in this moment. Dust to dust…the saying applies to people and to books. Those of us who work in libraries and archives are in the memory business. 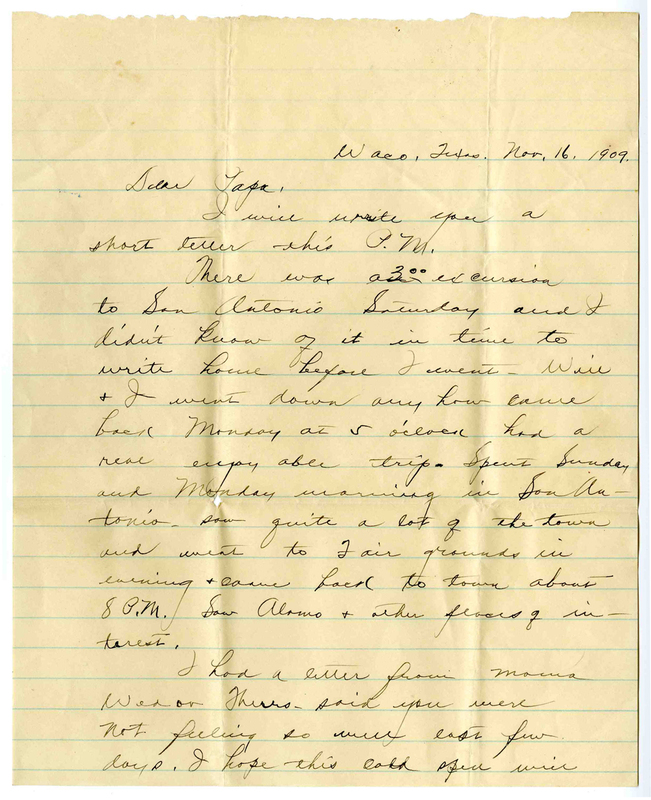 Though we do not know who Ida was, or anything of her friends and family, we preserve the memento they have left behind, and hold it for the researcher who may someday come to recreate the story of these lives, and others, that make up the story of Texas. Dear Ida Remember a beautiful life ends not in death. To Ida Love me little Love me long Do not flirt for that is wrong.